Join us as our wanderlust takes us on travels both near and far, with the perfect addition - our new range of lightweight Travel Towels. These towels will allow you to travel with style and you will love the luxe oversized square designs; these towels are big enough to wrap around yourself or use as a beach blanket. The highly absorbent fabric will fully dry you after a dip in the ocean but the quick drying cotton won't be too heavy to stow away for the journey home. 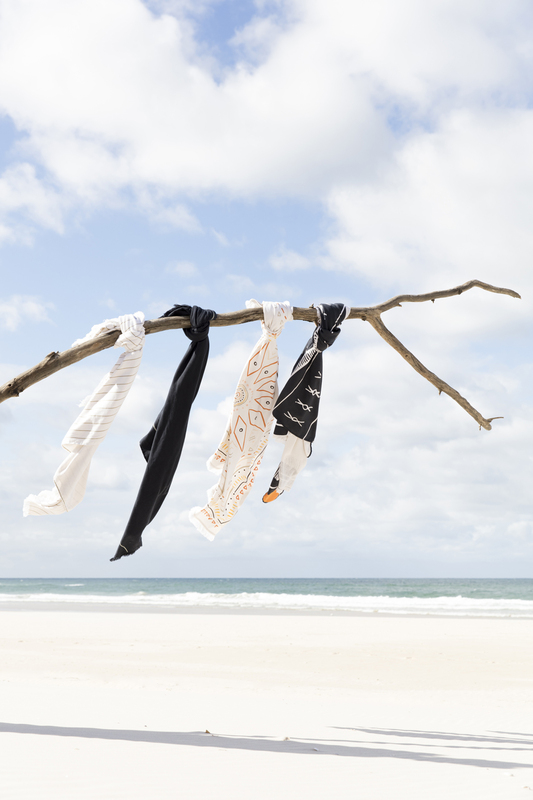 The Travel Towels will be a favourite for all of your seaside adventures this summer. Explore the four unique designs below. Pioneer: The classic Pioneer, a delicate khaki stripe set on a sand coloured background. Adventurer: Simple perfection, the Adventurer is a solid navy design with a running stripe either side. Dreamer: The Dreamer has a bold print of navy and white angular shapes and tribal design with a dash of rust. Wanderer: The Wanderer features a delicate array of sunny hues making up a stunning geo-pattern set on a sandy backdrop. Now you can travel even lighter with our new Travel Towels available in four stylish designs. Shop online now for the holidays.